There’s been a fair bit of discussion of ‘shared space’ recently, prompted mainly by the Holmes Report into Shared Space, which was released at the start of the month. 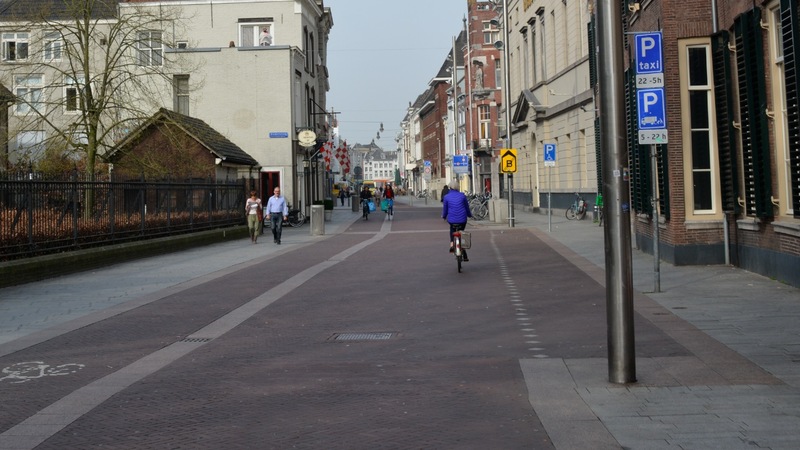 ‘Shared space’ is of course a catch-all term that covers a wide range of street and road treatments, but in essence it involves reducing distinction (either visually or physically, or both) between the carriageway and footway – between places where users are ‘expected’ to be, in general. I don’t think there is any genuine, or ‘ultimate’, shared space out there – one that has no distinction whatsoever across the whole building-to-building width. You will always find some kind of distinction, be it in the form of tactile paving, or colour difference, or a minimal kerb upstand, or bollards, between where different modes should be going. New Road in Brighton perhaps comes closest, with only a drain breaking up the uniform surface – but here sheer weight of pedestrians numbers, and a tiny amount of motor traffic, make this resemble a genuinely pedestrianised street with limited motor traffic access. And this points toward something a little bit back-to-front about how these treatments are often applied in Britain. New Road is a bit of an exception; it is effectively an access road, one that makes little or no sense to drive down if you want to go anywhere, because a one-way system sends you back to where you’ve come from. By contrast, ‘shared space’ treatments are instead frequently applied on roads that are through-routes for motor traffic, carrying it from somewhere, to somewhere else. Poynton is composed of a junction of major A-roads; Exhibition Road carries around 15,000 vehicles a day; Byng Place in Camden is a through-route; major schemes in Coventry and Ashford have both applied ‘shared space’ treatments to main roads. Preston, too, appears to have jumped on the bandwagon in the last year. ‘Shared space’ on Preston Fishergate, which remains a through-route for motor traffic. Indeed, all the examples of ‘shared space’ shown in the Sea of Change film – areas where partially-sighted and blind users have difficulty crossing roads – involve through routes for motor traffic. Meanwhile, all the small access roads near these big main road schemes – residential streets, or streets that (should) serve no through function for motor traffic – are left with ‘conventional’ highway engineering, footways with high kerbs, clearly distinct from what look like roads, rather than streets. 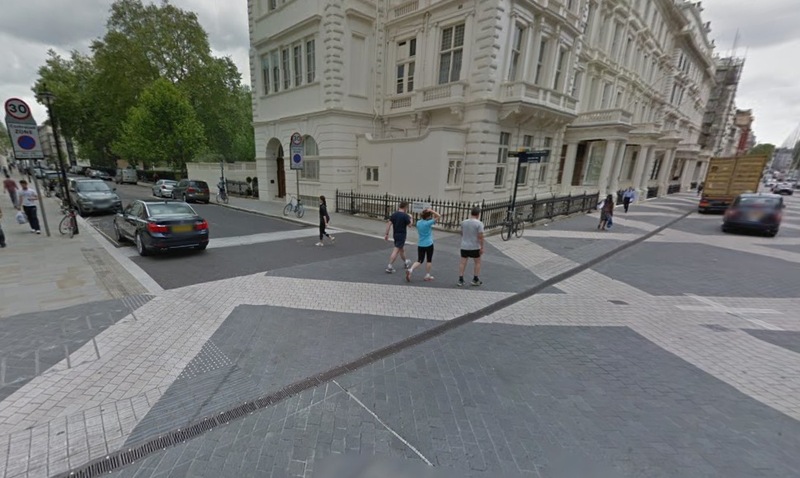 For instance, it is the through-route Exhibition Road that has the ‘shared space’ treatment (and a 20mph limit), while, bizarrely, the minor residential side-street joining on to it, Princess Gardens, has a conventional tarmac road appearance, and a 30mph limit. This is, really, the wrong way round, and entirely opposite to the way the Dutch conventionally design roads and streets, and distinguish between them. 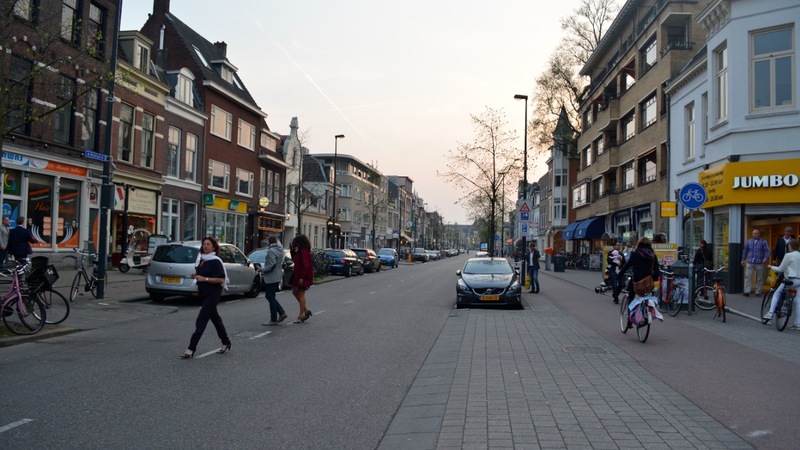 In the Netherlands, the ‘shared space’ style treatments are applied on streets that have been quite deliberately designed to remove through traffic, leaving only a very small number of motor vehicles using them – the access roads. Meanwhile the main roads, carrying through traffic, usually have very clear distinction between the carriageway and the footway (in large part because the Dutch clearly separate cycling from motor traffic on these kinds of roads). 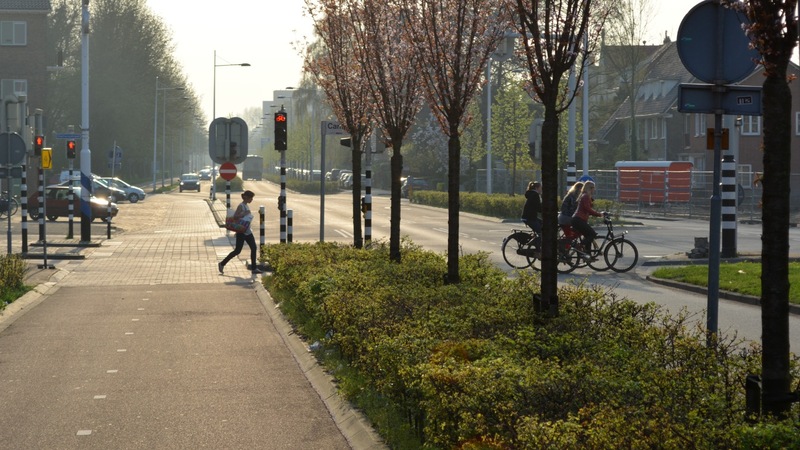 So what looks like the kind of treatment we might see on a fashionable main road in Britain is almost always applied on a very low motor traffic access road in the Netherlands. 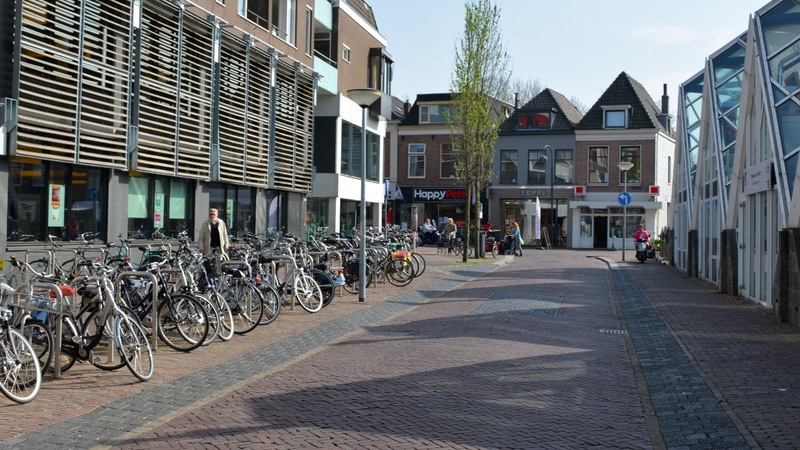 Examples from Wageningen, Gouda, ‘s-Hertogenbosch, Veenedaal, Utrecht, and Assen below – all very low (motor) traffic streets. Although these treatments looks like ‘shared space’, these are all autoluwe, or very low car traffic areas. These are appropriate locations for a lack of definition between footway and carriageway because the reason for that distinction – motor traffic – is no longer present. By contrast, the main roads near these access roads will have clear definition, because… well, these roads are still carrying a significant quantity of motor traffic – distinction is required. A main road in Wageningen. 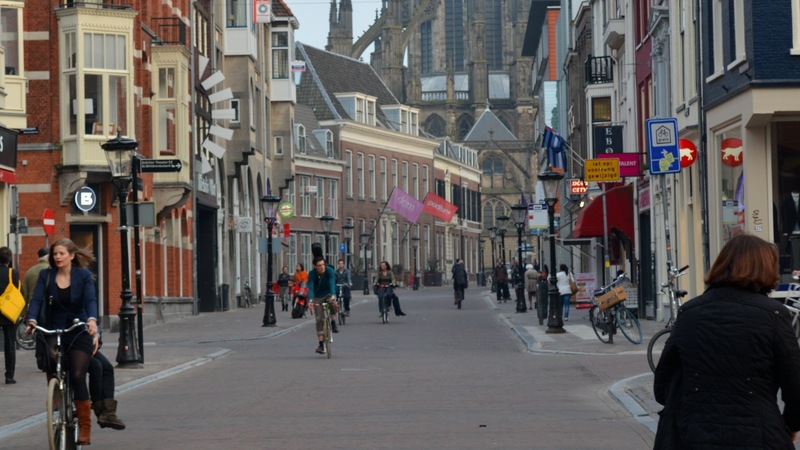 … And a main road in Utrecht. 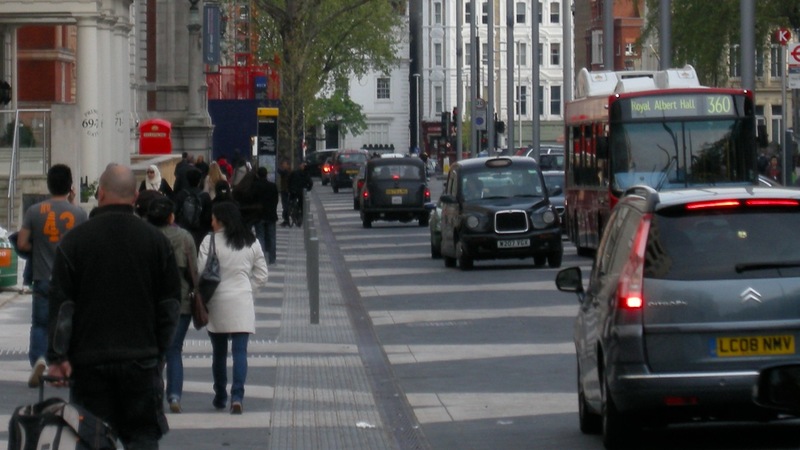 I don’t quite know how, or why, Britain appears to have grasped the wrong end of shared space stick, applying treatments designed for streets that are intrinsically suited to sharing – access roads – onto main roads instead, in an attempt to fix them. Perhaps it is because of an innate reluctance to accept we have a motor traffic problem. Perhaps we are attempting to convince ourselves that we can turn traffic-blighted roads into ‘places’ simply by changing the way they look, rather than honestly accepting that they are through-routes, or accepting that genuine places require an access-only function for motor traffic. (I’ve written about the need for honesty – and placefaking – before). 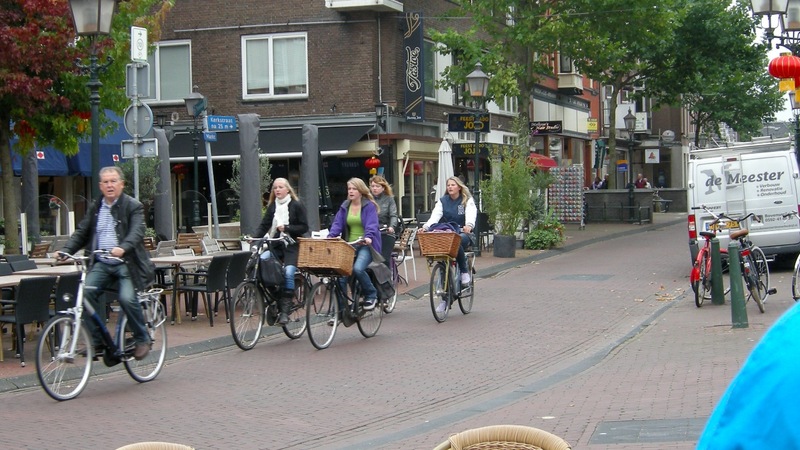 There is a role for shared space design (or whatever you want to call it!) in Britain, but it is vitally important that it gets applied in the right places, and in the right contexts. 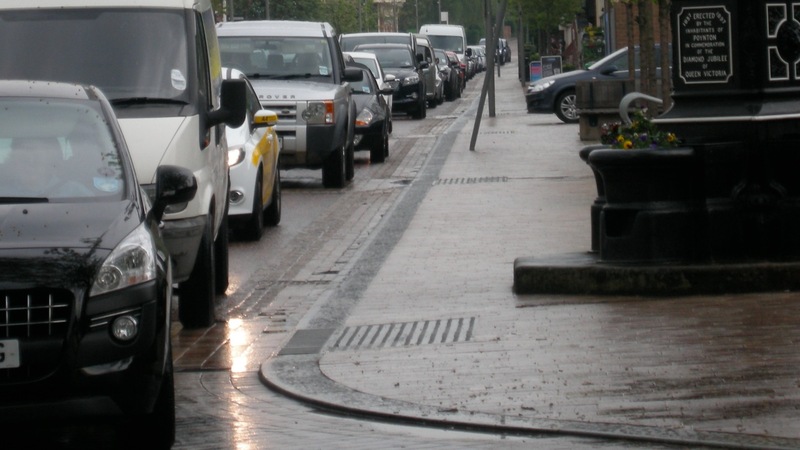 Making our streets and roads safe, comfortable and attractive for all their potential users – particularly those with physical disability or impairment, but also everyone walking or cycling about on them – depends on it. Minor point – Byng Place is in the Borough of Camden, but “Bloomsbury” would be a better description for where it actually is. Spot on. My recent holiday back in the UK has driven home how differently the British and the Dutch treat types of road. The different road types are evidently clear in NL simply from the way they look and the gateways that lead to them, you always know instinctively how you should behave due to the environment. Whereas in the UK, every road looks and feels the same, whether it’s a main “A” road, a shopping street, or a residential access road, leading to extra cognitive load of constantly trying to figure out how fast you should be driving, what dangers there may be, etc. etc. One place the UK does get it right ironically is with motorways (and motorway grade “A” roads). This kind of thinking needs to be extended to the other road types as has been done in NL via the Principles of Sustainable Safety. Shared Space schemes like Exhibition Road and Hackney’s vanity project, Leonard Circus, would be better described as ‘Anxiety Space’, as no-one feels comfortable within them. England has learned important lessons from the Dutch – from draining vast coastal wetlands for agriculture, to ruling distant countries through militarized corporations. In the fullness of time it will learn how to manage urban streets as well. I think the best example of shared space I know of, in London, was never actually conceived as such. Roupell St in Lambeth/Southwark forms part of the pedestrian route form Waterloo Station to the City. It used to be a rat-run for taxis from the City to Waterloo but the two councils put an end to that simply but breaking the road up into a series of opposing one-ways. You can access any address in the street, from one end or the other or from a street which joins near the middle, but you cannot legally drive from one end to the other in either direction. Pedestrians walk freely in the middle of the road (the pavements are way too narrow to cope with the volume at rush hour) and the few vehicles, mainly service vehicles eg refuse collection, simply have to give way. The street however is engineered in the convention way – tarmac road, vertical-kerbed concrete slabbed footways etc. Any street with low motor traffic will automatically default to ‘shared space’ no matter how it’s paved. It isn’t about how it looks, but how it feels. There’s a fundamental refusal to understand holistic design in the UK which leads to this sort of situation. 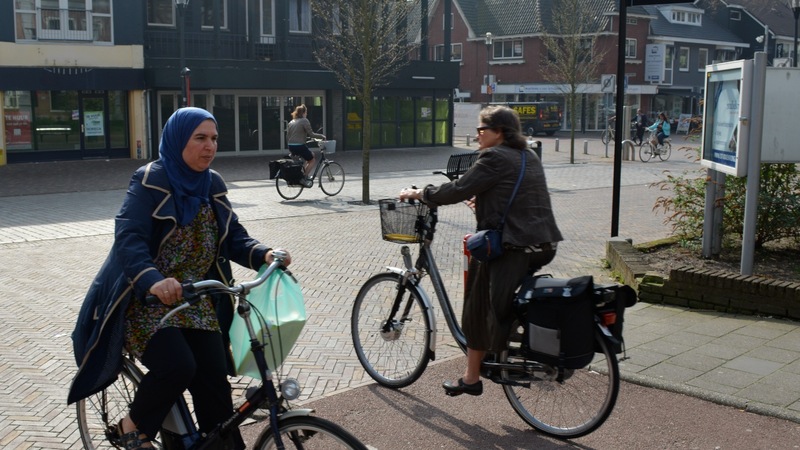 “But the Dutch have streets that look like this” is likely to be heard from many councils for a while. That only seems to be true if there are high pedestrian flows which force our British driver to give way (and presumably get annoyed at “all these bloody people in the road”). Any street – even a dead-end residential street (of sufficient length to allow acceleration), with a 30mph limit, kerbs and other ‘vehicular’ features like traffic signs, painted road markings (especially dashed dividing line down the middle) and single/double yellow lines, with an unobstructed carriageway and long sight lines, is a place where even the occasional car will dominate the space, at speed, and those on foot are expected to look out for and give way to. No kids playing in the street – too dangerous. 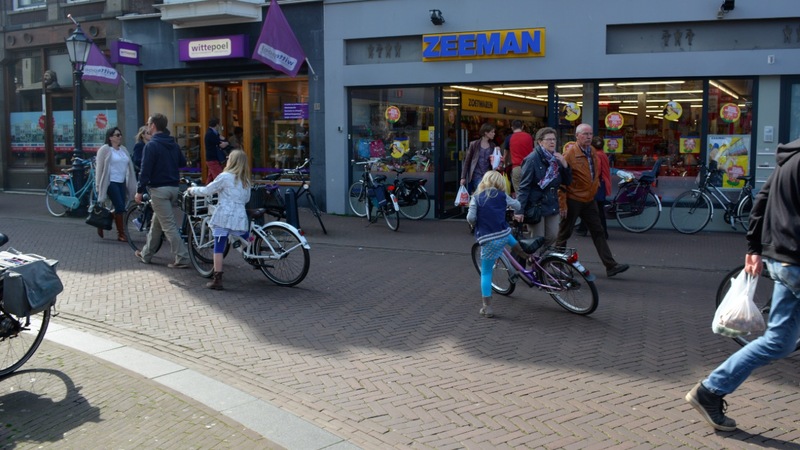 Parents will even unhealthily keep their kids indoors to avoid such streets – children are unable to judge speed and distance of vehicles and might walk out in front of a car (not to say they are bad parents – the car dominated infra is the issue). Conversely, a single undivided surface (“shared space style”) with low motorised traffic and low speed limit (10mph would be much better than 20), preferably with obstacles like parked cars and plants to break up drivers’ sight-lines, and little as possible ‘highway’ features like painted road markings, should naturally tell drivers to proceed cautiously and look out for people on foot, and people should be much more comfortable walking, especially those on bikes and the more vulnerable (kids and parents, elderly and disabled people). 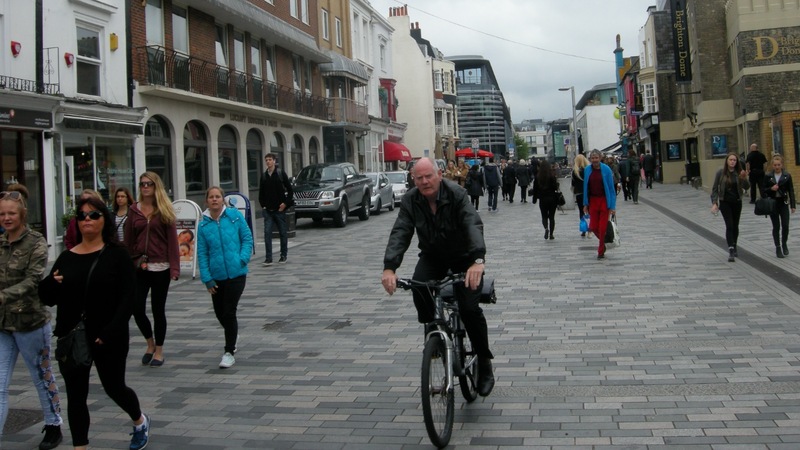 AsEasyAsRiding has got it exactly right – we are doing it the wrong way around, which means the above approach might not work so well on a low traffic access road as people in towns with British shared space roads are used to having priority by default on that style of street! Yep. I know a couple of dead-ends which are actually quite nasty. It’s incomprehensible: the driver must be at the start or end of their journey, and they are either a resident or visiting one. Why the hurry? They still feel better than busier roads, but the behaviour isn’t better, just less frequent. I think in the Uk these are, as Andy Clarrke says above, vanity projects. Re-engineering existing road with new surfaces and redesigning them without kerbs is expensive so councils restrict it to a very few streets; the ones with the most visitors so the ones with, businesses (mainly retail) on them and this usually means the busy main road through an area. Meanwhile (as where I live in the Westend of Glasgow) residential side-streets get “20s plenty” signs, a bit of paint to delineate parking schemes, speed bumps and one-way streets. All of which are relatively cheap and simple – a few new signs, some paint and maybe the occasional lump of tarmac. None of which really contribute to making the streets pleasanter for pedestrians or cyclists. 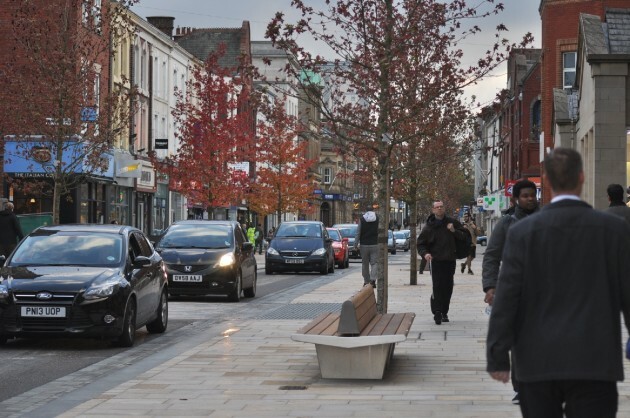 It would be great to see all the smaller residential streets redesigned as shared spaces, but it’s not a priority for the council as each street is only ever experienced by a few people (the ones who live there and their visitors) whereas the major roads are visited by many shoppers. Dan B’s point that streets with little motor traffic will naturally default to ‘shared space’ is borne out by my local area. All the streets are conventional in appearance – tarmac carriageway, pavements with kerbs, rows of parked cars – but because they form an area of dead-end residential streets there is no through traffic and little traffic generally; so people walk in the middle of the roads. However, is this really ‘shared’? I would ask, Shared with who*? If a road is used by a few cars, some cyclists and some people walking along it, is it really shared? It’s just a street with street uses. It only becomes truly shared when people can use it for non-traffic purposes: children’s games, picnics, funerals**, a cup of tea with friends, a market stall, and so on. *Grammar pedants can pretend I wrote ‘with whom’, or get irate, as they please. **Our neighbours held a street funeral, or rather street wake, when their grandfather died. But that was India – which just goes to show, ‘sharing’ must take into account the local culture. Spot on indeed. This post explains something I’ve felt but not really had clear in my head. Minor point – I think there’s occasionally confusion between shared-space as described here and shared -use (as in pavement) ie between pedestrians and cyclists. Some similar issues on busy share-use routes (perhaps to a lesser extent without cars). It also doesn’t help motorists. Through routes should be convenient and speedy, not as in speeding, but in reducing unnecessary jams and holdups – the parked cars that force you to give way, unclear priorites, random and inconsistent road layouts, and yes, cyclists you get stuck behind (because I will NOT overtake unsafely when I’m driving). Designing through roads properly and with properly designed separated cycle lanes, will improve the attractiveness of the main roads and reduce the need for rat-running, hence creating the quieter access-only roads elsewhere suitable for sharing, hence creating more cyclists, hence drivers get an even smoother ride, hence creating less need to build more roads for more cars, hence even more space can be taken away from cars to be used by people on bikes, hence… Getting the design right is a win-win for all road users. For two weeks in August, Porterlight Bicycles will be opening the doors to a pop up shop in Covent Garden. We’re passionate about bicycles and making cycling a more integrated part of peoples day to day lives. 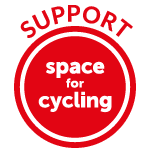 We’re really keen to get in touch with you to be able to send you an invitation to our launch party, and to perhaps see fi you’d be interested in speaking at our cycling evening (though just coming for a drink at the launch night would be exciting enough!). Please get in touch with me through sophie@porterlight.com as we’d LOVE to have you involved!